There are a lot of things I expect to end up writing about here on RoH. New game announcements, maybe something’s being made into a movie, who knows. But that list most certainly does not include circumcision, the act of surgically removing a man’s foreskin. Yet here we are. For those of you familiar with Silent Hill 4: The Room, you should know all about Walter Sullivan; the homicidal maniac that was abandoned in apartment 302 and raised by the series’ resident cult, The Order. What you may not remember is an excessive amount of symbolism linking Walter’s disturbed outlook on life being linked to having been circumcised as an infant. Well, visiting Walter’s Silent Hill Wikia page for the last few days has taught anyone who cared to know all about this possibility as one of the Admins for the Wikia has written out a long, rambling diatribe about just that. 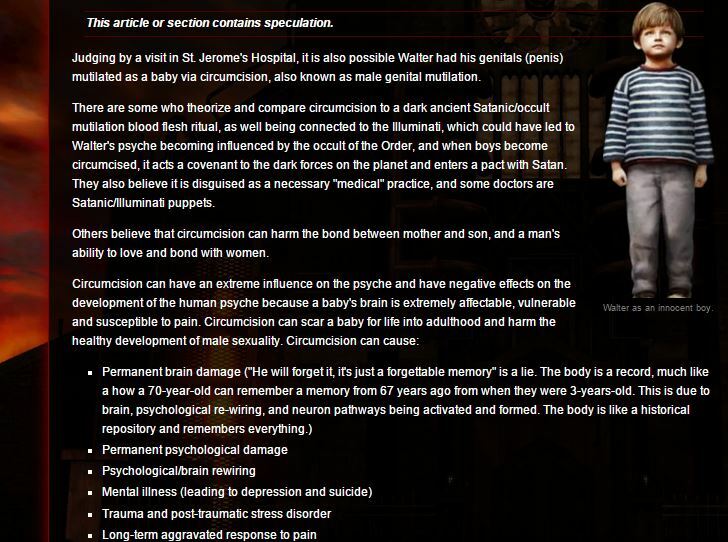 Detailing not just a theory about how this Admin believes that Walter was a victim of genital mutilation, but also goes into excruciating detail about how circumcision is actually a construct of Satanism and the Illuminati and that doctors are puppets of this conspiracy. Not just in the game lore mind you, but in our world. It actually gets worse from there. A long list of explanations as to why circumcision is bad has now been laid out smack in the middle of the page, as well as a fervent defense of why it should be considered child abuse and a human rights issue. Honestly, that’s all fine, I guess. Don’t really know about the Satanism/Illuminati thing, but everyone is entitled to their own beliefs. The real question is: What the hell does any of this have to do with Silent Hill? When the other users and contributors to the Silent Hill Wikia noticed this sudden addition to Walter’s page, they questioned it in the Wikia’s forums, where this whole episode took a turn for the… well, frankly startling and upsetting. It even turned into something of a Twitter side show as both fans and even the actual developers of the games themselves took part in the shock and hilarity of all this, you can actually read the whole storified event here. Admin AlexShepherd, the one who edited Walter’s page, came back with not just a defense of his actions, but an angry, violent attack against anyone who questioned the edits. Eventually locking the page from being edited further by users other than him, deleting and editing other comments on the thread, and writing long, angry, rambling thoughts on the Illuminati, Satansim, how Americans are “sheeple” being controlled by blind faith and politics, and that the Silent Hill franchise as a whole is a social commentary on how screwed up America is. Um. The worst is yet to come, however. People even started to notice this weirdness infecting other areas of the Wikia, as Shepherd edited other characters to fit in with his circumcision theories as well as a bizarre and equally unfounded little additions about things like a theory that the character Alex Shepherd from Silent Hill: Homecoming being homosexual, despite the fact that Homecoming is one of the only games in the series that actually has a romantic interest character. Again, doesn’t matter if Alex is or not, it’s totally cool if he is, but there’s literally nothing to substantiate this in the games, not to mention even less to substantiate bringing the circumcision stuff over to poor Alex’s page too. 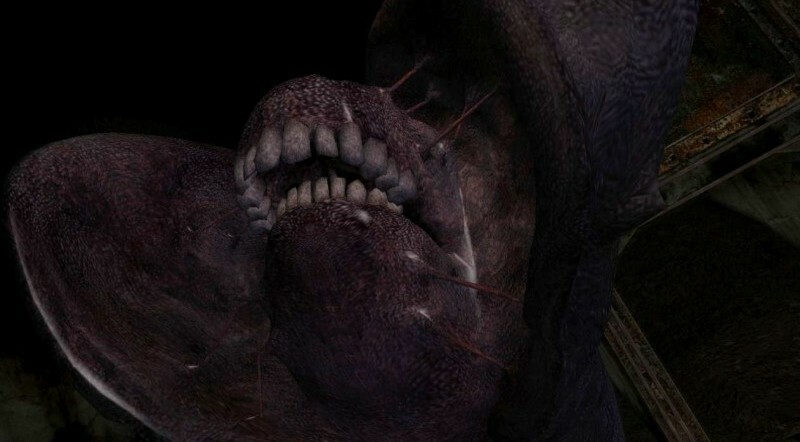 By and large, the people arguing with him weren’t really against the concept that maybe circumcision is bad, but mostly that it didn’t have anything to do with Silent Hill, and that maybe at best the whole thing be relegated to a theories page. But Shepherd seemed to look straight past that and demanded that the edit not only stay in its prominent spot, but also that anyone who questioned him was neither a true fan nor an intelligent human being. Sniping typos and providing pseudo-science sources for his beliefs, it soon became a raging war as his explanations began to become less and less about the terrors of genital mutilation, and more about how America, and all of religion is everything that’s wrong with the world. This uh, well, didn’t go over well with the others in the thread seeing as many of them are American, religious, and in at least one case, actually Satanist. Shepherd dismissed most of the backlash as being non-applicable since most of the comments from users and other moderators where female, saying that as women they could not possibly have enough perspective on male genital mutilation to even contribute to the discussion. When one user pointed out that that argument was not only really misogynistic, but also that she has a son, he not only dismissed this as well but made the argument personal, attacking her over whether or not she had her son circumcised. Obviously, she didn’t take this extremely invasive and personal question that well, yet he further demanded to know. Wow. Somehow, that actually gets worse. Enjoyableari was pretty understandably upset by this. Shepherd told her to grow up. I don’t even know what to say. The thread has gotten so much traction it’s even shown up on a completely unrelated news site, NYMag.com of all things. The once remarkably thorough and informative Wikia has become a laughing stock overnight, smashing any and all credibility it has ever had. It remains to be seen what will become of AlexShepherd, or the Silent Hill Wikia as a whole, but if you feel like helping get the Silent Hill fandom back on track, a friend is building a new Wikia called Silent Hill Fan. While it’s only just starting, and there isn’t much there just yet, but at least nobody will start screaming at you about the cons of circumcision. All jokes aside, I do want to stress not seeking out Shepherd and attacking him over this; it won’t make the situation any better and honestly, everyone seems pretty surprised by all of this. According to other Admins he is known for being nice and committed to the Silent Hill community, and this whole thing just came out of left field. It’s possible he might very well be going through either an emotional or mental breakdown in his actual life right now, and this is the outcome. That said, he is clearly abusing power, and his actions have been unacceptable towards his pears – there’s a pretty staunch difference between trying to argue your point and attacking the people you’re arguing with on a personal level, much less attacking the way they raise their actual, real life children. In my honest opinion, just stay away for now. Sit on the sidelines until an alternative source of credible Silent Hill series facts appear. I hope this gets resolved soon, but it’s been going on for three days now. I’ve used the Silent Hill Wikia in the past, and it’s a shame to see it go downhill. Even sadder yet, someone potentially suffering from some serious problems has yet to receive help.